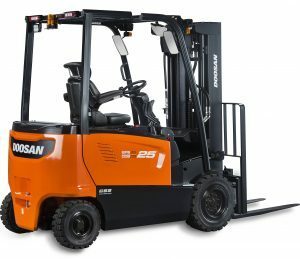 Doosan are pleased to announce the introduction of the completely new, high quality electric 80-volt 2.2-ton to 3.5-ton capacity range of 4 wheel forklift truck models. The latest additions to the 7-series range continue to follow the Doosan tradition of delivering simple, powerful performance, while most importantly ensuring the best possible value for our customers. While maintaining reliability and durability, the new models significantly improve ergonomics for the operator’s comfort, all-round visibility and manoeuvrability. The expanded range, now including XL long wheelbase variants with increased battery capacity, means that Doosan has the most modern and widest ranges of electric counter-balance trucks to suit any electric truck application. As always, safety was at the forefront of the design brief, and increased serviceability and modern styling with the latest electronic control system to further benefit our customers, were high priorities from our global dealers and customers. Infinitely adjustable, superb controllability and exceptional reliability makes the new Doosan 7-Series electrics, the operator’s choice of truck. The AC drive, steer and hydraulic motors, all deliver smooth and seamless power, whilst offering the lowest possible energy consumption. Other highlights include LED spotlights for improved illumination however using less power and vastly reducing bulb failures, upgraded protection packages on the motors and one of the most comfortable seats on the market. redesign of the masts has provided greater visibility through the mast, with the rear grab handle accompanied by a horn and panoramic mirrors increasing safety and all-round visibility. For most warehouses and production facilities, efficient storage is crucial, and these latest 7-series electric trucks have been specifically designed to meet this demand. The new 4 wheel models have a brand new steer axle which has been innovatively designed to minimize the turning radius and can now achieve a superb 93.2° steer angle. In addition to this, the newly designed round shape of the counter-weight enables the truck to move comfortably in and out of narrow spaces, reducing damage costs while maximizing storage potential. In addition, the new range are also rated as safe for outdoor use. The new sealed controllers are rated to IP65 and the motors rated IP43, with an increased IP54 rating available soon. 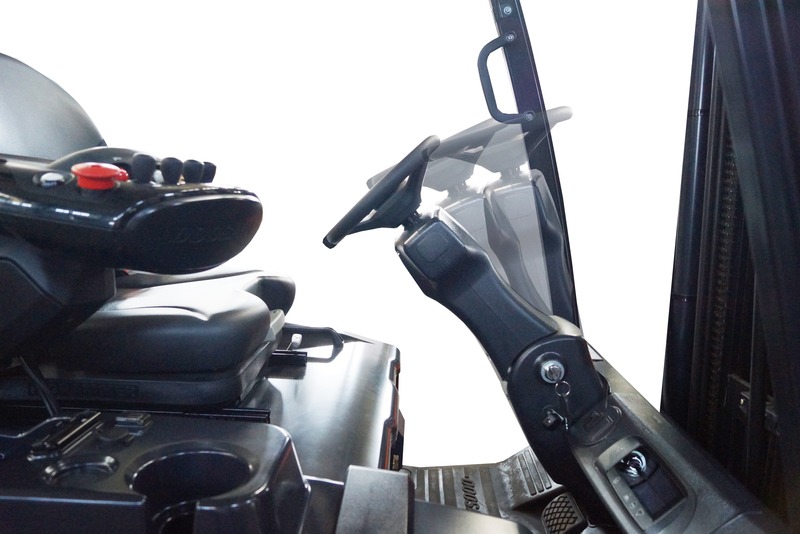 The new trucks offer a wide variety of valuable safety features. Doosan’s ‘Guardian Stability System’ (GSS) meets all customer requirements and provides maximum stability during every operation. There are also numerous other advantages and benefits, in terms of maintenance, cost savings, higher performance, reduced noise, energy saving, improved serviceability and added valuable options. For more information, please contact us on 01604 825600, www.doosanflt.com or visit us at the IMHX Exhibition on stand 11P61 at the NEC in Birmingham, 13-16 September.